Updated! Integrate anything from Vue to React in your daily development. eLearning courses right inside your IDE get you going fast. Puts the joy back in web UI coding! The steady stream of new tech can leave you feeling outdated, but there's no reason to get left behind. 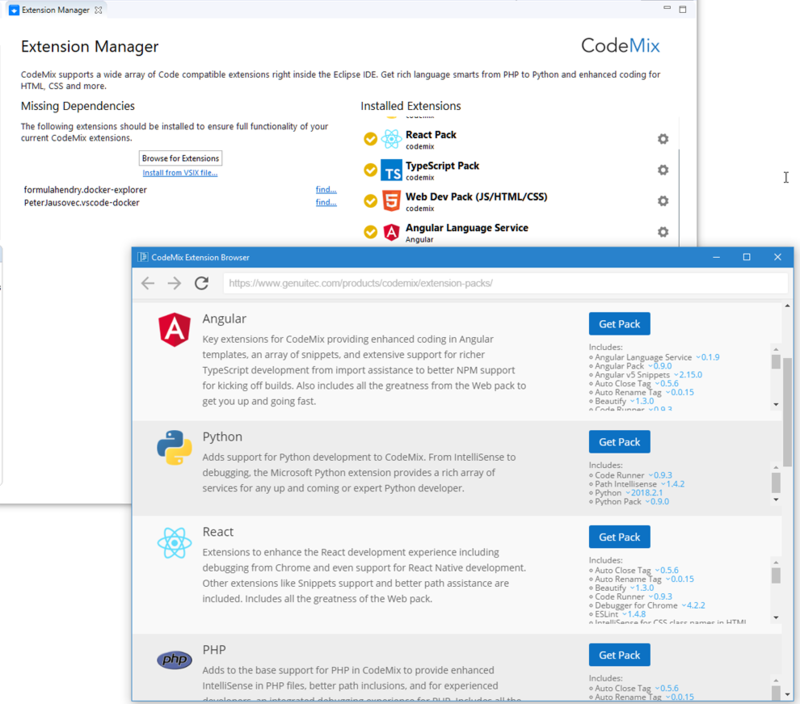 CodeMix can be installed on top of leading Eclipse solutions like MyEclipse, Spring Tools Suite and JBoss Tools, and is compatible with popular plugins like PDT and PyDev. CodeMix, is a powerful tool for the professional developer, so we offer a free 45 day trial to give you time to discover all it offers. After the trial, you'll be impressed with how much you get for so little: $29/year (our best deal) or $5/month. Your investment in CodeMix allows us to keep improving, making a great product even better! 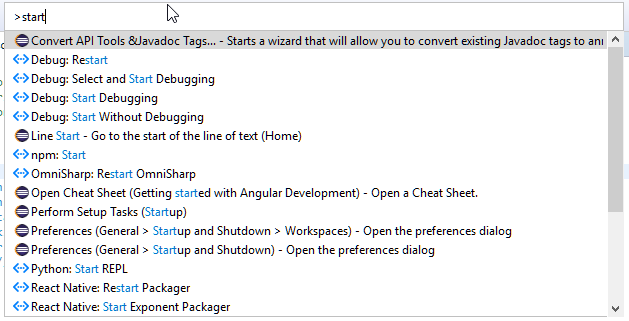 Already using MyEclipse, Webclipse or Angular IDE from Genuitec? You get CodeMix included in your current license. 117 Cannot continue the operation. There is another install operation in progress. By adding the following code below to your website you will be able to add an install button for CodeMix 3. I installed codemix pack but one message, again and again, show some notifications. that message is " please install codemix node pack". but I don't know how to install that package. anyone help me. The message should be accompanied by a button that will allow you to install the pack. 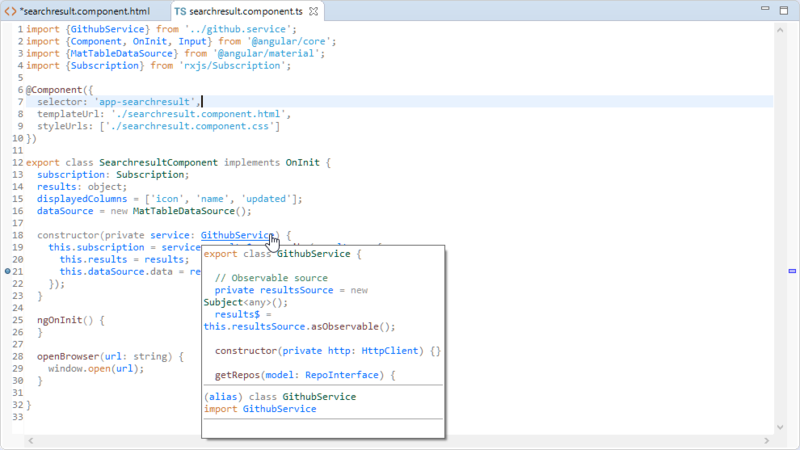 You can also go to Help > CodeMix Extensions, and select the Node pack under the CodeMix Extension Packs section. Do contact us at the Support URL if you're still experiencing issues with the installation. Startup time dramatically increased and overall performance was very sluggish. 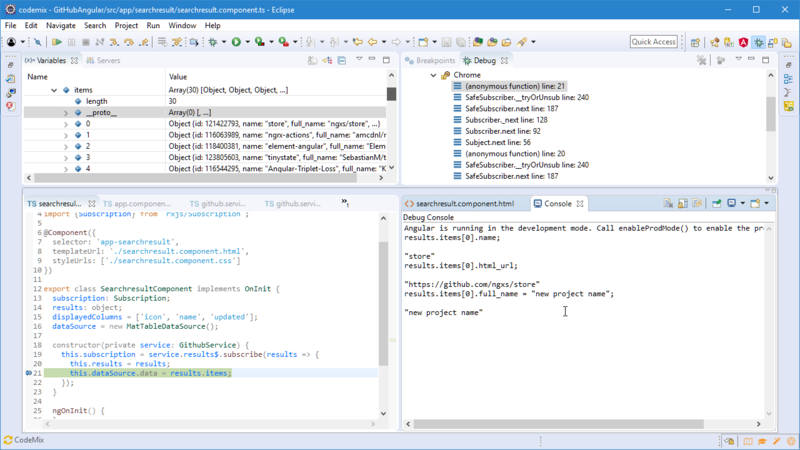 I was no longer able to do my current project build within Eclipse. Something was locking a project folder and causing a Node permissions failure. This would also occur from a system terminal whenever Eclipse was running. With Eclipse closed or CodeMix uninstalled the problem was resolved. May give this another try sometime in the future. Thanks for the comments. With an update release imminent, we hope you'll give CodeMix another try soon. There are many fixes and performance improvements in the release which could go a long way to addressing your concerns. If you try again and encounter issues, please raise them on our support forums at https://www.genuitec.com/forums/topics/codemix/ or, better still, use the built-in live chat facility, where our developers can give you real time assistance. Select Help>CodeMix>Live Chat to start a dialog. After it expires if you don't want it, you have to uninstall. I uninstalled and Eclipse crashes on start,.. java.lang.IllegalStateException: Unable to acquire application service. Ensure that the org.eclipse.core.runtime bundle is resolved and started (see config.ini). Very annoying!.. When it expires you can't open your files any more. No button to re-set the file associations back and uninstall breaks everything. Cristian, we're sorry your Eclipse installation was corrupted after uninstalling CodeMix, and can understand how frustrating that must have been. In rare cases, uninstalls (which are handled by core Eclipse) do not run through to completion due to a variety of reasons, and if bits of CodeMix are left behind, it would result in a broken state, as you have experienced. I will add that uninstallation of our software is part of our test matrix - it is regularly and rigorously tested, and we do not have a general failure in this area. I realize this note comes too late for you, but when your license expires, while we disable the CodeMix editors, instead of uninstalling CodeMix, you can simply disable it instead, on the Preferences > CodeMix page. On restart, the IDE will go back to using your non-CodeMix editors. Thanks for using CodeMix. We're keen to look at any improvements that users would like. Just installed, disabled for too much CPU overload, prompted to restart Eclipse: BOOM! Eclipse broken, empty window, no menus, no tabs, no way to solve from within the application!! If you have a solution please answer! There are several reasons why this could have happened - the good news is that all these have been fixed in the very latest 2018.11.26 release of CodeMix. Please see this post for more details, or just update to this release. I'm sorry you're seeing this problem Alessandro. First off, this isn't the best place to raise problems, as it can sometimes take a few days for comments to appear. It's best to use the support page at the link above. Please try starting with a new workspace and see if that fixes the immediate problem. If you can try the plug-in again, we can handle the issue on our support forums. If you go that route, please supply as much information as possible and attach the workspace error log. Thanks for trying CodeMix and I hope you give it another shot. Updates are quite frequent. After I installed codemix, I can no longer save edited .js files. Kind of a drag! Need to get this off my machine as soon as possible. That would certainly be a serious limitation with your workspace. Unfortunately, you didn't give a lot of information for us to investigate this (it's not a problem other users have reported and we use the plug-in ourselves but haven't seen the problem). If you'd like to give the plug-in another go, please raise any issues on our support forums where you will get a speedier response and we should be able to resolve the issue. Please include as much information as possible when raising issues and attach the workspace log, which is often helpful. It would be nice if the JS formatting supported alignment like PHP does. and the PHP alignment could use some improvements for more complex scenarios. like double columns per line. Support more assignments like ".="
alignment across minimal switch cases.. So please do browse for other extensions that may suit, and do let us know of the good ones that we could consider to include as standard. I'm sure extension developers would also love to hear ideas from users of their code. I'm using CodeMix with Webclipse plugin on Eclipse Oxygen. It works great except one important feature. I can't Ctrl + click on elements anymore. On HTML files and TS files (opened with CodeMix editors), clicking + hover will display a popup with the element definition but if I click on the element, nothing happens. I am not redirected to the element definition. Sometimes my cursor just moves to the element declaration if it's in the same file but if it's not, nothing happens at all. This functionnality works with the Webclipse editors. This actually only happens on a big project. I have another small Angular project for which Ctrl + Click works perfectly with CodeMix Editors. I ended up reinstalling Eclipse on my computer (delete all eclipse related folder, download and install Eclipse Oxygen 3, install WebClipse then CodeMix). I imported my Angular project and it seems to work now. I can Ctrl + click on elements and it takes me to the definition in both HTML and TS files opened with CodeMix. Time-based licensing simply means that when i open an old project, I spend the next week trying to get the environment working - and then forced to reinvest / re-register / re-located keys & logins - only to use the tool for a couple of days for deployment or quick update. = ClusterF for smaller ops. Version-based licensing is the way to go... working for atlassian.. once I lock in my environment, I'm not screwed with I move it to another VM 2 years later. I purchase a license that lasts FOREVER with the benefit of 1yr of updates. Those who stay on the cutting edge ( AND use the tool the most ) will contribute more funds out of necessity [& rightly so due to usage] - those who infrequently use the tool aren't enslaved to the same burden. This is tantamount to ransomware IMHO.. this said, GREAT tool. First off, it’s great that you like the product! Completely understand that different people prefer different models. By providing a subscription model, we can allow many people to have access at a low price point instead of a higher cost for just a few. The ability for getting just 1 month for $5 means you can also just get a license for that limited time you need to come back to the project instead of purchasing another year. I realize perhaps not in exact alignment with your perspective, but we did try to make it accessible! We also like that subscriptions give everyone access to the latest features they need, unlike version-locked licenses where companies can force a pay-event for users simply by restricting support for Feature X to an upgrade, such as "upgrade for Angular 6 support."